Without a doubt, blogging tools such as Twitter have been great tools for fans to share and receive information. The best part about it, however, has been its ability to filter out the junk information that surrounds the game of hockey. A local sports reporter was being interviewed on the radio this morning and suggested a current Oilers enforcer Luke Gazdic was a better player than former Oiler Georges Laraque. It was quickly picked up on Twitter. Rishaug on 1260: On Gazdic: "Absolutely, absolutely, you lock him up. he doesn't hurt you on the ice… better than Georges Laraque"
Aside from his fighting prowess, Laraque was an exceptional player for someone in his role. The quickest comparison to Gazdic is that Laraque scored 34 points as an AHL rookie; Gazdic had four and never hit 30. 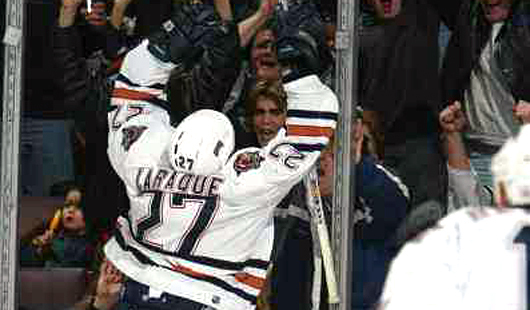 Where Gazdic is just breaking into the majors at age 24, Laraque was in the middle of a 29-point season at the same age. It’s possible Gazdic has been slowed by his shoulder problem this year, but even so there is no comparing the long-term track record of these two, either as fighters or as hockey players. And since Viktor Fasth lost to the Ducks today, you can add that to the list as well.